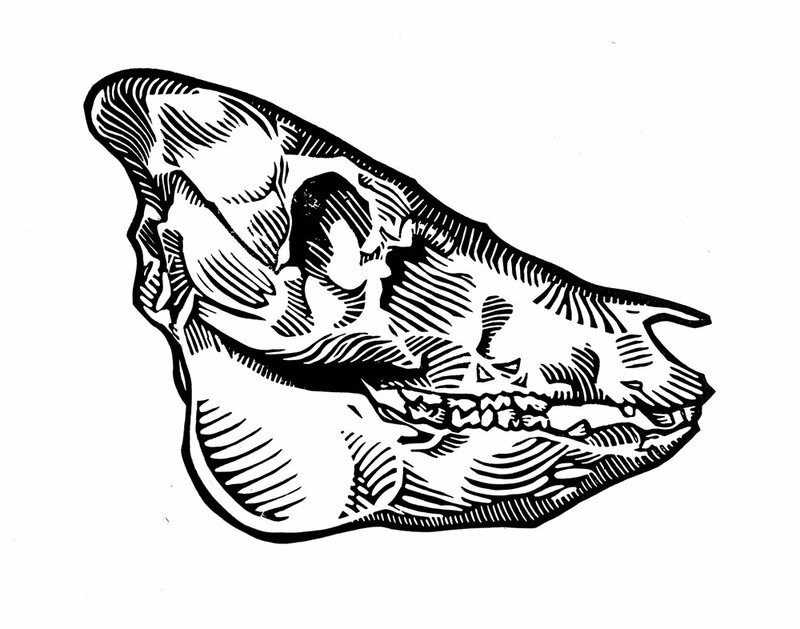 I’ve started work on a new commission, and this is an interesting one. 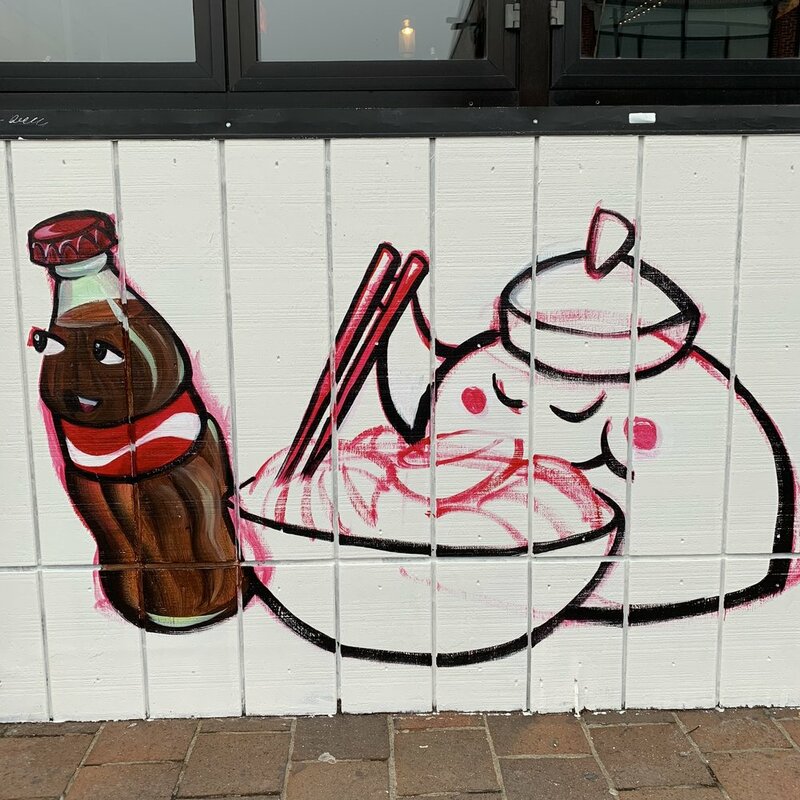 The project is to paint a mural of cartoon drinks from Asia celebrating in a Last Supper style scene. It’s unique, fun, and I’ve got to get it done before it gets too cold outside! I just put the basic drawing down, and next I’ll add tone and color to the 4x26’ wall. 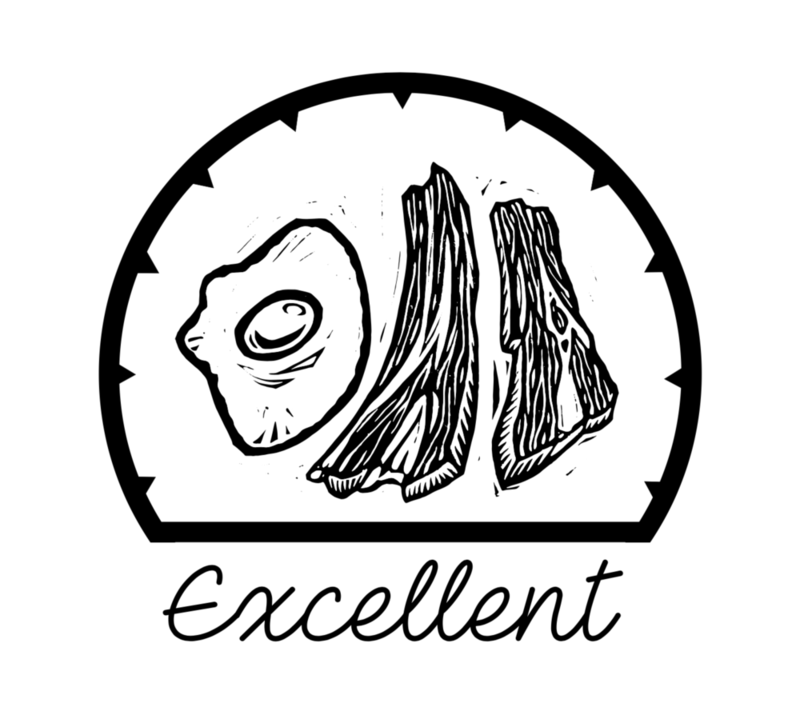 This logo design is for Excellent Breakfast, a restaurant known for their incredible thick-cut bacon. 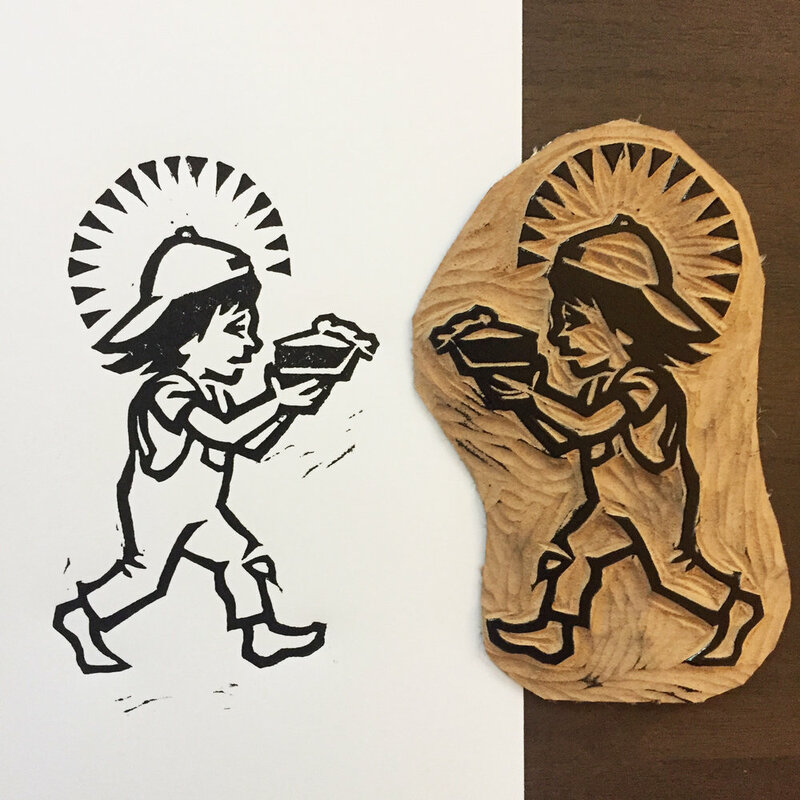 I applied my linocut print to a circular design that can read as balance, a plate, or a morning sunrise. To match the atmosphere of the decor and menu, the design has a minimal but modern take on tradition. 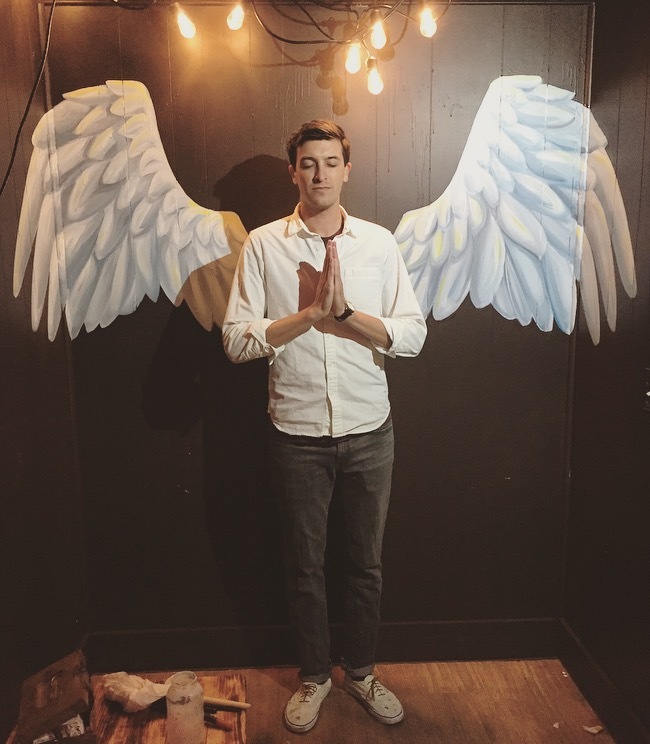 A recent commission was to paint angel wings at a restaurant, intended as a sort of “instagram corner” for the enjoyment of customers. I’ve included process photos for how I started with light lines for symmetry, drew the feathers, then filled with highlights and shadows. It was a welcome step away from my typical work. Someone sent me this nice photo of the coffee cups used at Saint Monday, displaying a stamp of one of my designs. I’m happy with how they incorporate the prints on cups and menus, and the bar itself is beautiful inside. If you haven’t been yet, stop by and say hello to John and Morgan at 393 West Fountain Street in Providence. In support of Walden’s GoFundMe campaign, I made Thank You cards to be delivered to the generous friends that have donated to the cause. Walden has had multiple procedures and surgeries for a tumor on his shoulder, and is thankfully happy and energetic at the moment. 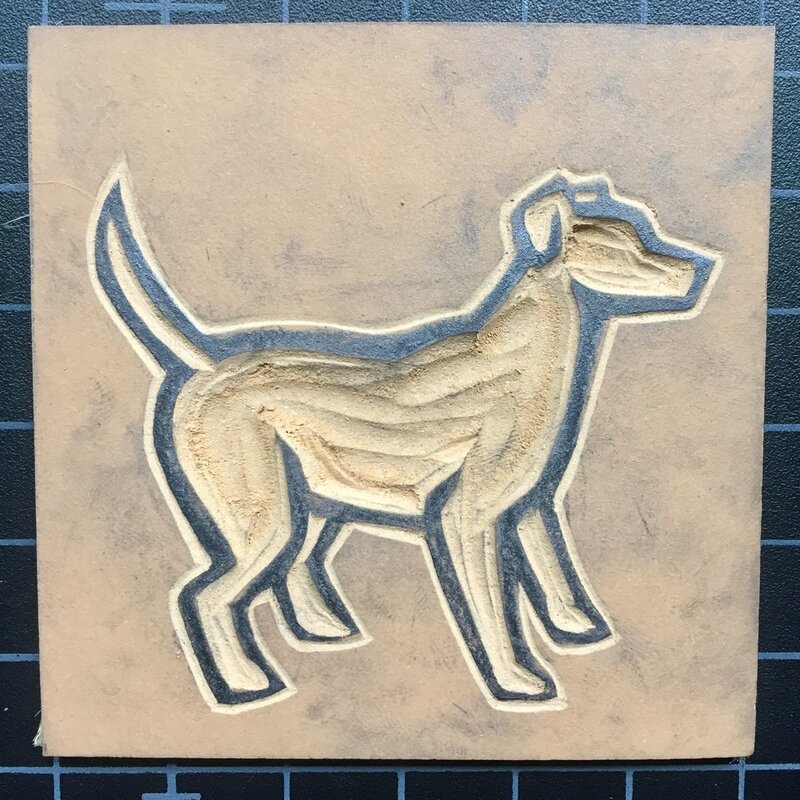 My best morning includes carving linoleum outside with a French press. 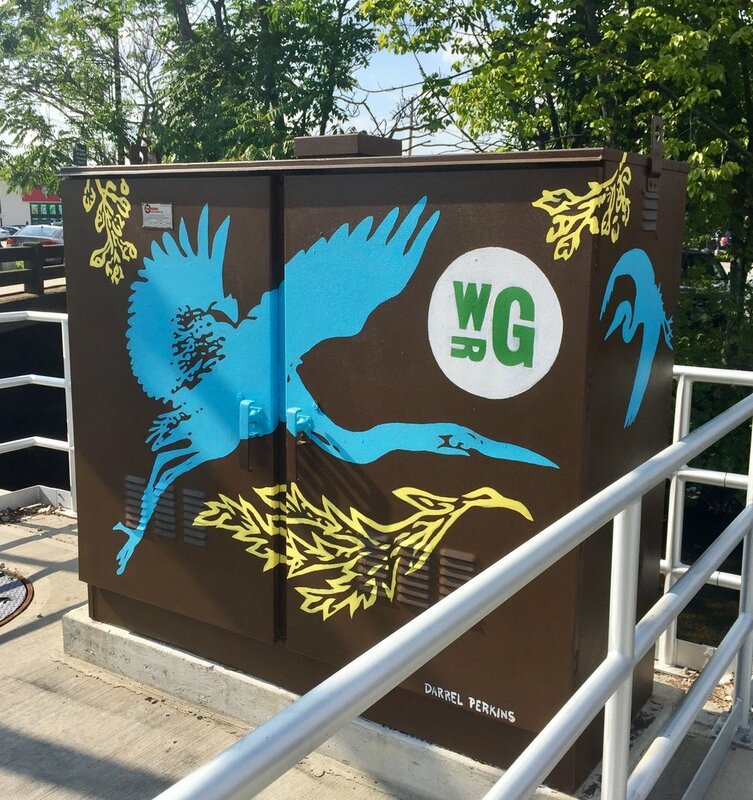 Throughout this spring and summer, I have worked with the Woonasquatucket River Watershed Council to design and paint fourteen murals on electrical boxes along the river running from downtown to Olneyville in Providence. It's part of a massive plan to beautify the area once ruined by textile factory pollution. 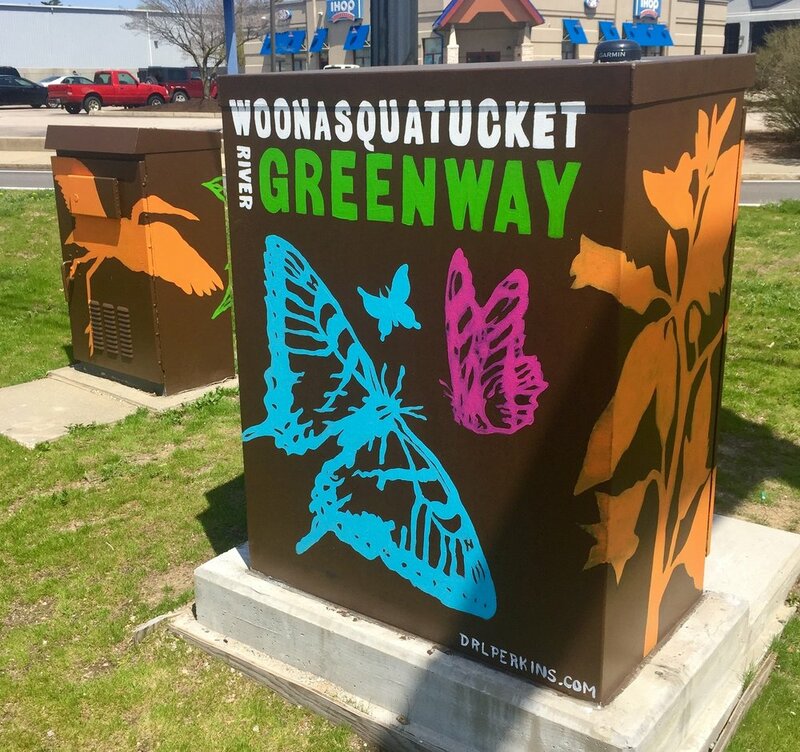 The river greenway now has parks, bike lanes, cleaner water, and murals to improve the surrounding community. 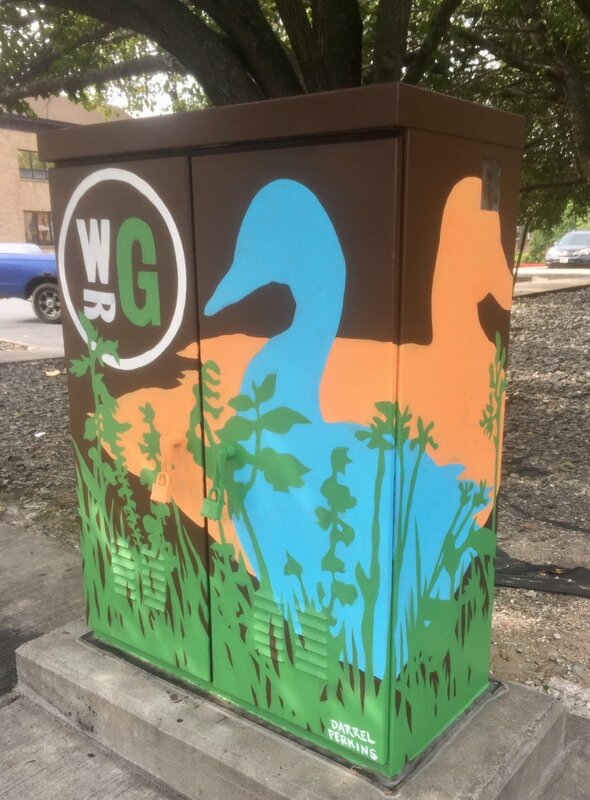 My commission was to work within their color and logo branding while implementing plants and animals native to the river ecosystem. I'm proud to be a part of this great project! 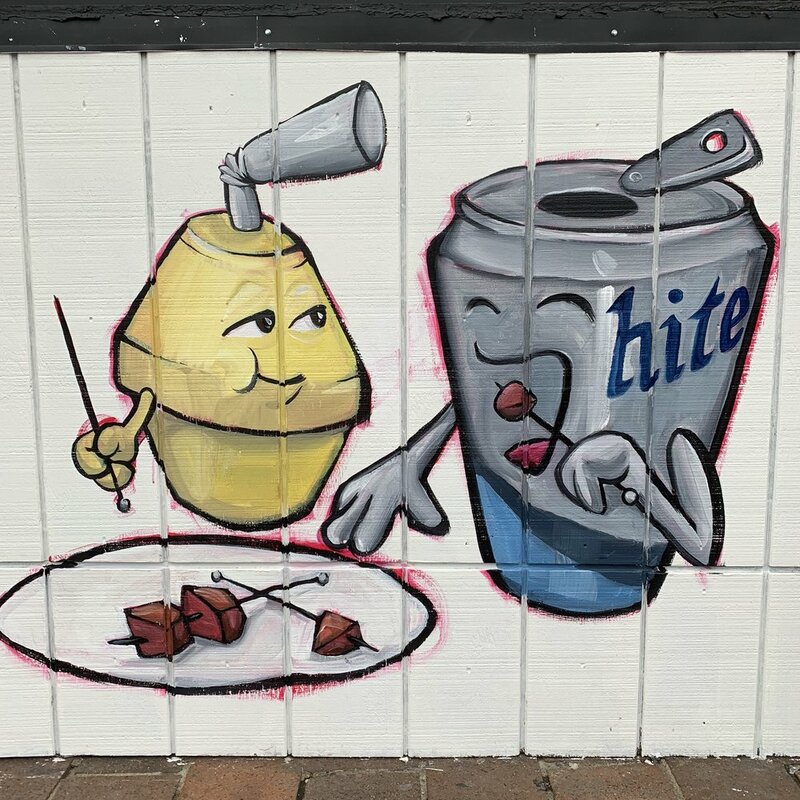 I designed and painted an 8x16' mural for a new restaurant opening soon, Lekker BBQ. 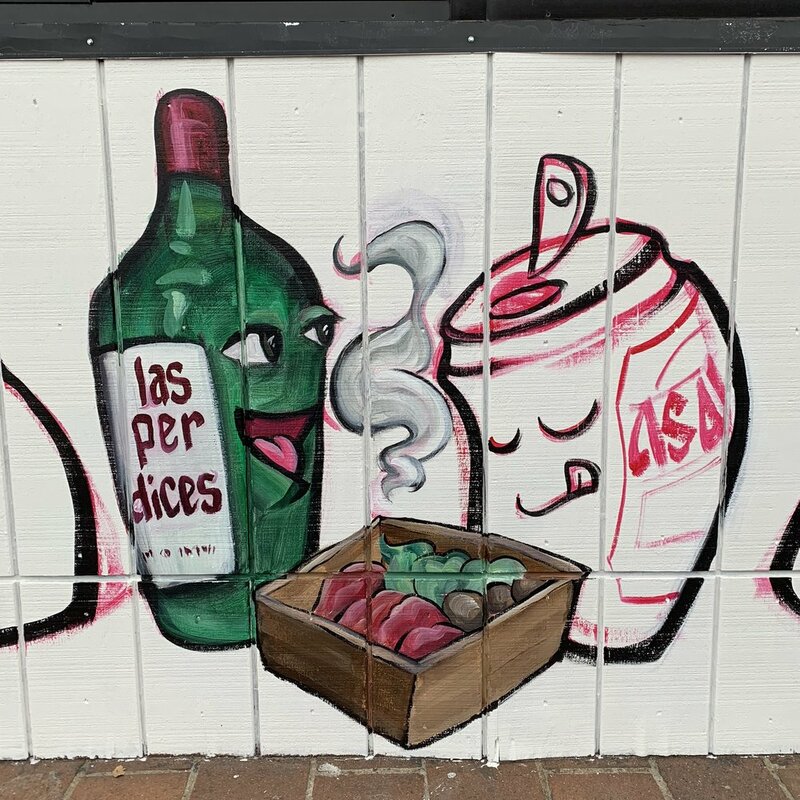 The scene is a narrative of the history of BBQ, starting with Paleolithic man hunting and eating meat, progressing to a campfire, then to cookouts, and finally the modern eco-friendly smokeless BBQ system featured at Lekker, which will be the first of its kind in New England. 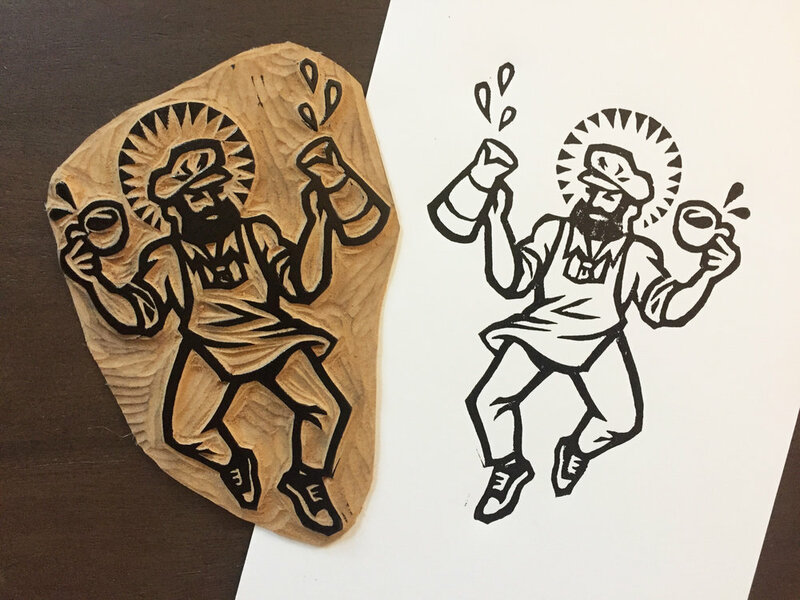 This is some commercial work I'm doing for a local bar opening on the West Side of Providence. Saint Monday is a seventeenth century working class British tradition of extending the weekend by taking Monday off. 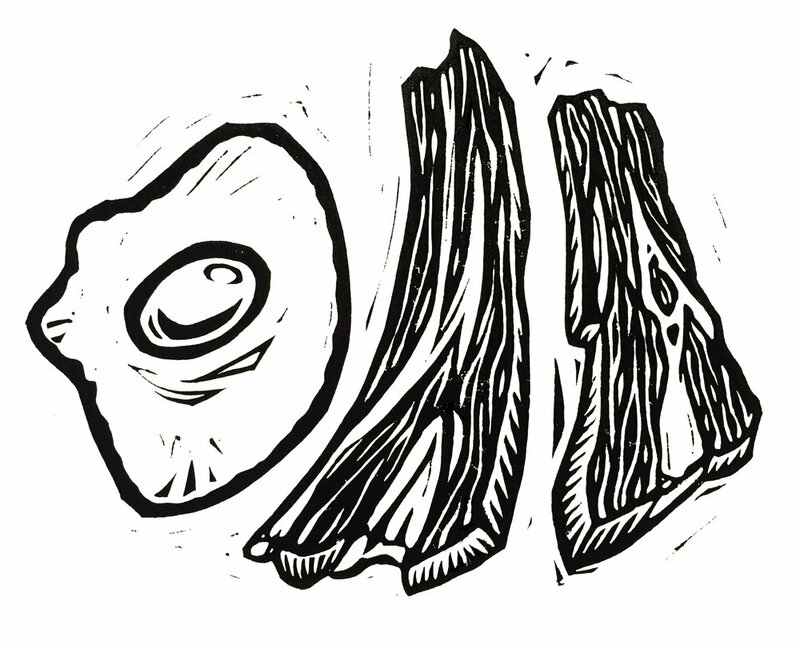 My linocut designs have applied this concept to a Mid-Century blue collar American family. 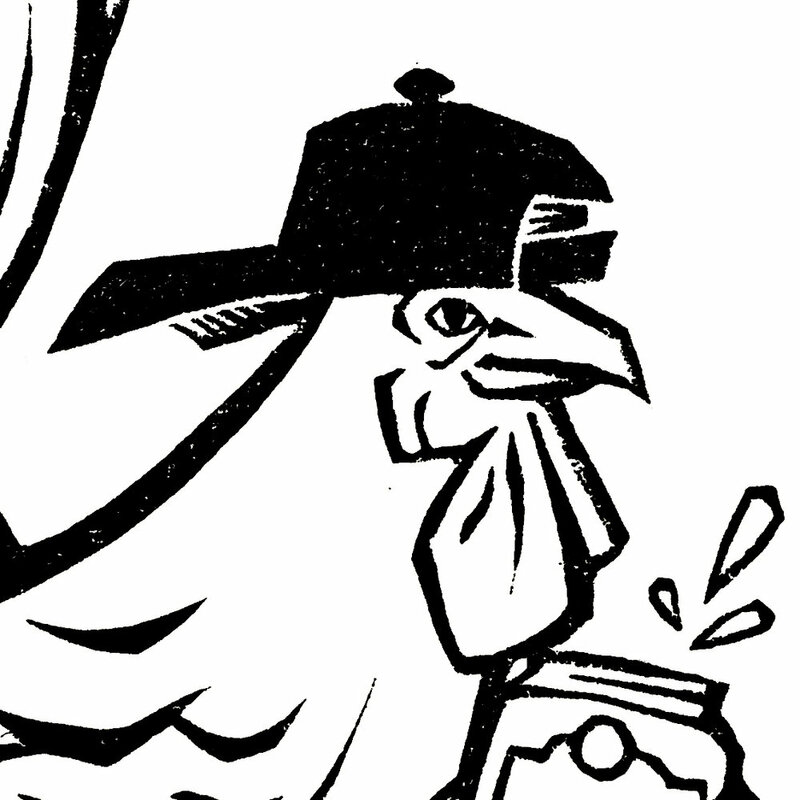 My favorite thing about illustrating chickens is that no matter what they're doing or thinking, the eyes stay blank and devoid of expression, except perhaps "alert". 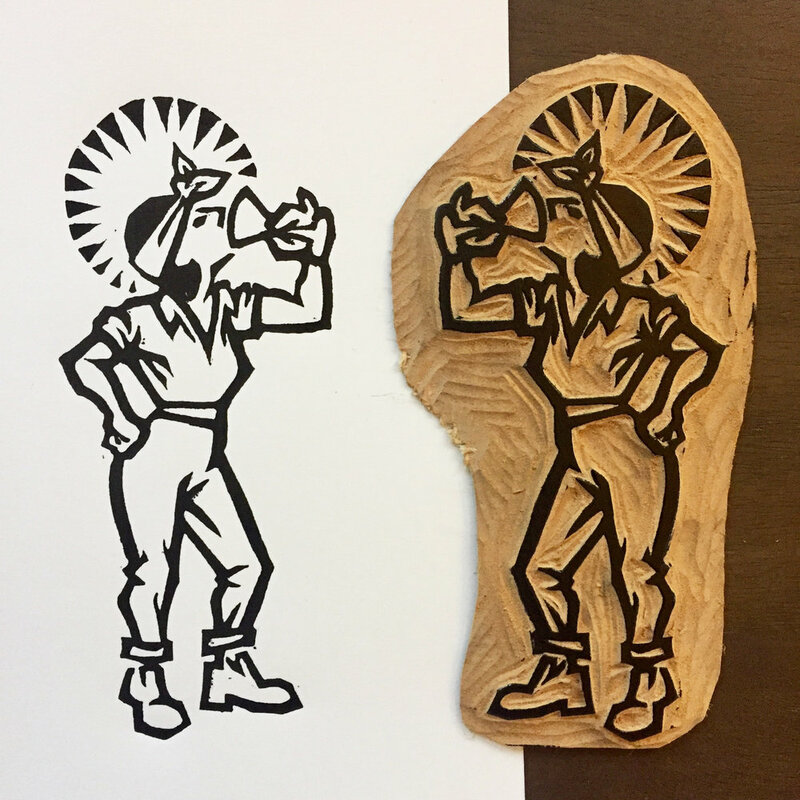 The Rhode Island Red book I'm writing and illustrating is steadily moving along, and now it's time to catch up on printing my linoleum block reliefs for a few pages featuring hot wieners, 'Gansett parties, and snow storms.